Are you a fan of the classy and neat nail art? 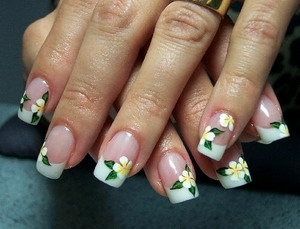 Then sure you are excited to find out how you could brighten up the simple pattern of French manicure. Undoubtedly, the latest French manicure designs offer us the chance to enhance the beauty and length of our nails with decorative and fancy patterns and prints that suit the warm season. These adapted to pedicure as well and manicure will highlight your fondness for healthy and spotless manicures. Put your creative skills to a test and experiment with these simple and stunning designs. Those who are mesmerized by the beauty of French manicure and by its power to highlight the beauty of the nails and their length might long for a change and versatility for their next visit to a nail salon. In this case pro nail artists come to your help with an endless parade of the latest French manicure nail designs. Finding the right prints and patterns for the shape and the dimensions of your nails is the secret to sport a flawless and worth-admiring manicure. Colorful prints as well as refined and splendid drawings serve as the best accessories to upgrade your nails and stay versed with the evolution of modern nail art. These are only some of the most stylish ideas to try your hand at next time you put your nails in top shape. 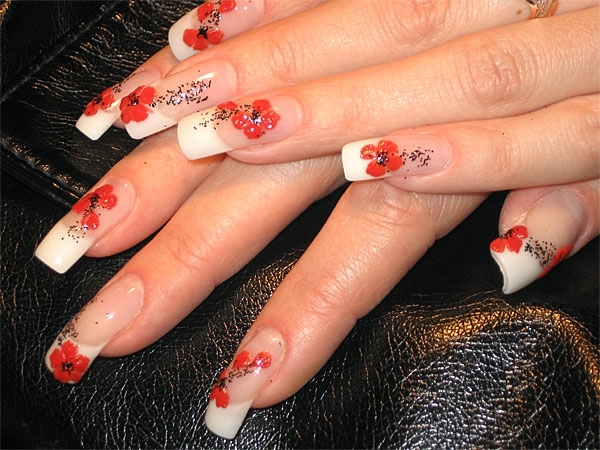 Floral patterns are only some of the most popular and at the same time easiest prints to wear on your nails. These can be easily created with a dab of creativity and handiness. Make sure you appeal to the use of high quality nail varnishes and tools to make these patterns more sophisticated and spotless. Short as well as longer and acrylic nails look stunning when paired with these designs. Choose from the stylish shades and draw the desired pattern on a sheet of paper first to perfectly follow the lines avoiding any disaster. Furthermore, you don't have to stop at simple flowers, decorate your nails with these but add a few nail stickers or gemstones to make your manicure more eye-catching and unique. Keep your nails in a spotless condition, adapt the length to your preferences and create the classy French manicure base first then proceed to prints. Leave the first layer to dry completely as skipping this important step might spoil your brand new and chic manicure. Ask for these designs at the nail salon if you are not confident enough to experiment with them at home. Matte nail polish shades are oh-so-popular this summer and also for the rest of the year making your nails crowd-pleasing as well as neat and classy. On the other hand, glittery tones and colors and the more vibrating shades can also make the right statement if you wish to shift the attention to your manicure. Learn the art of French manicure step by step to be able to proceed to the next level. Pair the right nail art to your finger shape and skin tone as these are the two basic factors that can determine the outcome of your nail art project. Keep these in mind whenever you decide to look for the next print or pattern you would like to sport on your short or admiringly long nails. Take a peek at these pics in order to draw some inspiration from some of the pro artist works that made these nails memorable.